Home > Catering > Cupcakes or a Traditional Wedding Cake? Cupcakes or traditional wedding cake? Both seem to be very popular choices for cake at wedding now but which should you choose? These are so fashionable right now and therefore quite easy to get hold of. They come in various different colours, shapes, sizes and flavours. They could appeal to some of your fussier guests, as the combinations of flavours are endless. Try simple sponge with pink icing and a strawberry on top or chocolate sponge with yellow icing covered in edible glitter and sweets. These little cakes can be in various colours, which will easily match your themes. Keep them traditional in white and gold or go for a retro look with pastel pinks and blues. The opportunities are endless with these sorts of cakes. They’ll be presented on cupcake stands and, because of the quantities you need to feed you guests, will cover quite a large expanse of table space. This means they can be used as a focal point of any room, should you want them to be. Much easier to serve than a wedding cake and usually less expensive these are great for anyone who wants a quirky, cool wedding. A more traditional choice so if you want your wedding to be very formal and traditional then this certainly is the way forward. There are many options you can have with a wedding cake in terms of colours, flavour and decoration. If you think your wedding cake should have something then ask. If you want glitter and stars then you can have them. These sorts of cakes tend to come as fruit cake or sponge with cream and jam filling but that doesn’t have to be the case. It is your cake, would your guests prefer chocolate? 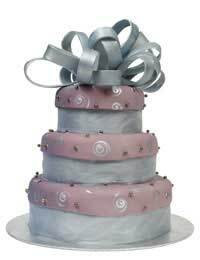 There are various options for the shape of your cake, round tiered, square tiered or flat. Think about how each of these would look in your venue, what is most in keeping with your themes? The upside to having a wedding cake is getting a photograph of you and your partner cutting the cake. This is a very traditional and beautiful shot, which isn’t so easy to get with hundreds of cupcakes. If you are having a small wedding with limited space then a tiered cake will take up less space than cupcakes, which can make small spaces look untidy. You also have the option of getting little plastic figures of yourself and your partner to put on top of the cake. These could be made in your exact likeness, the option is there for making the cake very personal. It’s hard to choose. Both types have their good points. If you want quirky and retro then go with the cupcakes, they’ll look stunning and will make a very welcome change. If you go for the traditional cake then your guests will not be disappointed. Your photography will be traditional and beautiful. Guests will be more than happy to clap and cheer when you cut the cake and they probably won’t mind having to wait a little while whilst it is cut up for them to eat.